Former New York Times reporter and communications director Phillip S Gutis was one of the patients left crestfallen when Biogen pulled the plug on its Alzheimer’s drug trial this week. Gutis, 57, was diagnosed with the neurodegenerative brain disease in 2016, placing him in the slim category of the four percent diagnosed before the age of 65. Writing a heart-wrenching op-ed for the Times on Friday, Gutis said he ‘knew’ that the trial’s odds of success were remote. ‘But it gave me hope,’ he said. Gutis, who had a distinguished career in journalism before senior positions at the ACLU and the National Resources Defense Council, explains that it was through a Biogen memory loss trial that he was diagnosed. He’d been forgetting things, and Biogen was looking for people to take memory tests. Their screening, and brain scans, revealed Alzheimer’s. Straight away, he learned Biogen had a clinical trial to testing a drug called aducanumab that they hoped would slow Alzheimer’s progression by targeting beta-amyloid – proteins that destroy connections between nerve cells. The trial was one of many, with various pharmaceutical companies racing to find a treatment or cure for the increasingly common disease. Eli Lilly, AstraZeneca Plc, Roche AG, Pfizer Inc, Merck and Co Inc, and Johnson and Johnson all had drugs in the pipeline. But one by one, they all dropped off, largely due to safety concerns. Biogen’s drug, which Gutis says was administered via regular infusions, was the last one going. On Thursday, the firm, along with Japanese collaborator Eisai, announced the trial was ending because the drug showed little-to-no benefit compared to a placebo. The announcement dealt a final blow to the theory that Alzheimer’s researchers and drug makers have pegged their hopes on for a decade: that amyloid plaques are the target to beat. Despite all others failing, Biogen had published a paper in 2016 that suggested promising results. Once theirs, too, flopped it was a sign to the field that we are still completely in the dark about what causes and exacerbates Alzheimer’s. Gutis, who joined the trial straight after his diagnosis, writes in his op-ed that he didn’t see much, if any, progress, but the trial gave him a sense of purpose. What’s more, he says, he felt his participation was making a difference. ‘Why put myself through all that when I knew in my heart that the drug wasn’t going to stop my Alzheimer’s progression? I truly believed that I was a small piece in the search to find a cure,’ he said. Over the years, Gutis says, his cognition was slowly slipping away. 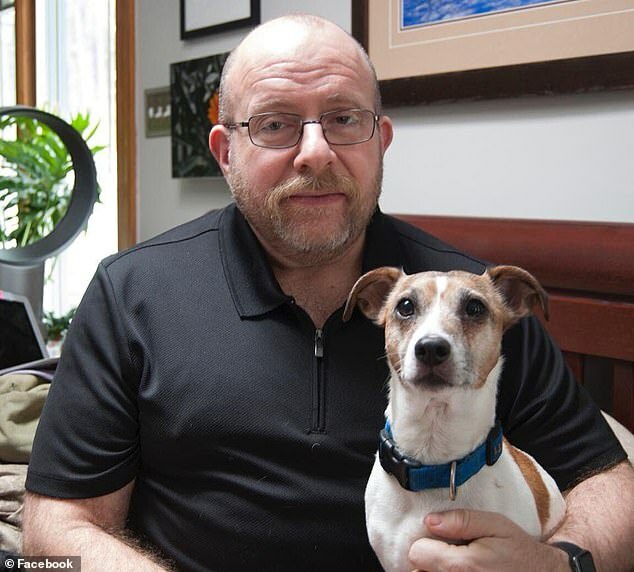 He believes his memories of his recently-deceased dog are all from photographs, and he has been forced to retire and sign up for disability checks, struggling to keep up with basic tasks.